Ever tried to bake a whole fish in oven? My family loves steaming or pan-frying fish. As this king snapper was frozen, then thawed, I decided to bake it in my oven without a second thought. The fish was wrapped inside a foil parcel as a result it absorbed all the fragrance and flavours of the sauce and seasonings. The salty, tangy and mildly sweet sauce made the whole fish even more delicious. Preheat oven to 190C / 375F. Scale and gut the fish. Rinse with tap water thoroughly. Wipe dry with kitchen towels. Season with salt and pepper on both sides and inside. Heat oil in a non-stick fry pan over medium high heat. Briefly pan-fry the fish until both sides are lightly brown. Line a large piece of foil (or baking paper) on a baking tray. 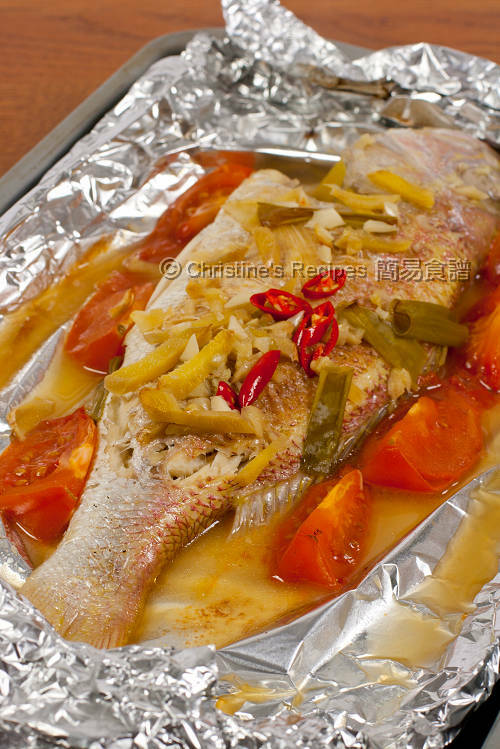 Carefully transfer the fish on the foil. Drizzle the sauce. Arrange the tomato wedges and spring onion around. 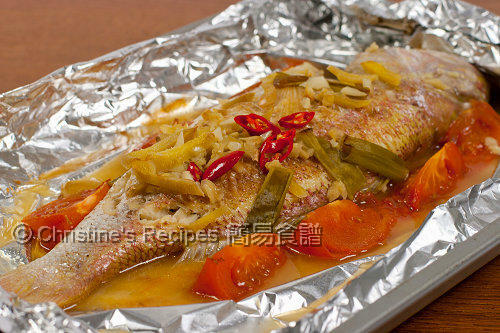 Fold the foil to wrap the whole fish inside. Bake in the preheated oven for about 25 to 30 minutes. Serve hot. If an oven is not handy to you, you might like to pan-fry the fish, then cook with the sauce. Very very delicious! I love Thai flavour and fish is definitely a favourite.